What is an air source heat pump and how does an air source heat pump work. What is A Samsung Air Source Heat Pump? Imagine reducing your heating bill by half, slashing your carbon emissions and getting money back with the Renewable Heat Initiative for the next seven years. If you want a new heating system that is 350% efficient and you are off-gas or want to replace your inefficient boiler, then a Samsung air source heat pump could be the new eco heating system for you. 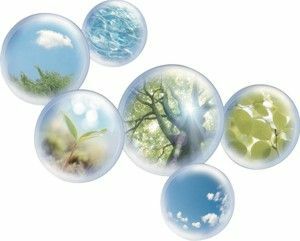 A heat pump uses the heat from ambient air, which is a FREE and RENEWABLE energy source for heating and domestic hot water in any property. It works like a fridge, but in reverse and using this system is an energy efficient and environmentally friendly solution. When combined with a wet underfloor heating system, a heat pump is so much more efficient and creates a much nicer home environment than a traditional heating system. An air-source heat pump transfers heat from ambient air outside to water in the home. Because the energy input is used to MOVE heat rather than GENERATE it, a heat pump gives out much more energy than it uses - as much as 4kW of output for only 1kW of input. A heat pump works by circulating a refrigerant. A refrigerant has a low boiling point, which is altered by changes in pressure. It absorbs heat as it boils (evaporates) and releases that heat as it condenses back to a liquid. By pumping it round a circuit and controlling its pressure, useful heat energy is transferred from one place to another. In a refrigerator or air conditioner, heat is extracted from where it is not wanted and deposited at the back of the fridge or outside. A heat pump uses the reverse process: heat is drawn in from the outside air - even in cold weather - and transferred to the hot water cylinder or pumped through radiators, heat emitters or under floor heating circuits. 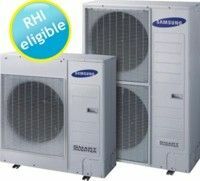 A Samsung EHS Split System (Type TDM) can also cool or heat air inside the home. The key is the efficiency with which the heat is transferred from the outside to inside, particularly in colder climatic conditions. This is why the Samsung EHS system has been so successful. It's high efficiency means that less energy is required to produce hot water, saving on running costs and reducing the impact on the environment. For independent advice on heat pumps and the latest news of available grants, visit the Energy Saving Trust.